19 December 2014, at 12:41p.m. 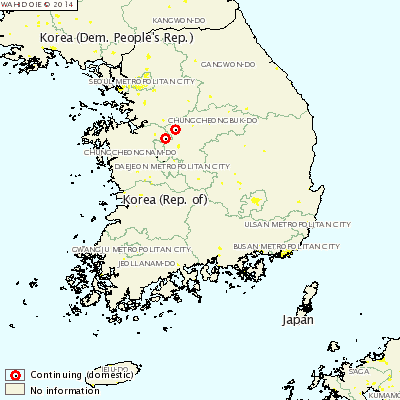 SOUTH KOREA - There has been two new outbreaks of foot and mouth disease detected and confirmed in the Chungcheongbuk-do region in South Korea. In all, 457 domestic swine where infected by the outbreaks, all of which have now been destroyed. The source of the outbreaks is still unknown.